Let’s not be afraid of making yeast bread. It’s really easy! I promise! Start by activating your yeast in warm water. 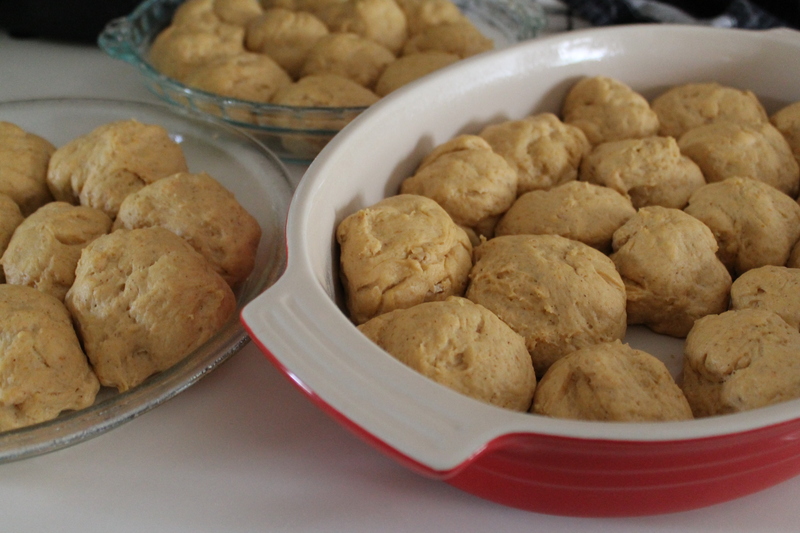 Stir in sugar, salt, butter, eggs, pumpkin, spices, and 2 cups bread flour. 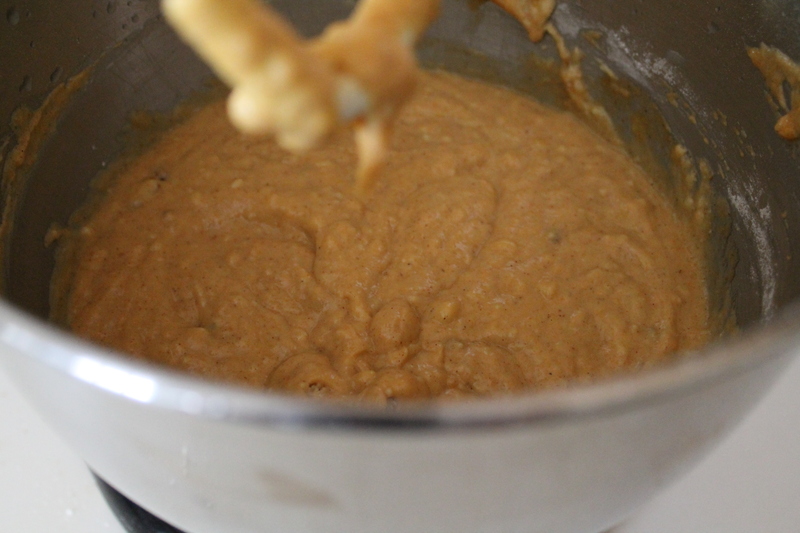 The mixture will be a bit clumpy, like thick tapioca, but don’t worry about that! As you add more flour, it will come together. Here’s a little side note. I recently read in Bakewise that using honey will keep baked goods moist longer. Okay, so Shirley’s tip was in the middle of a chapter about cake, and she was actually talking about the reason baked goods with honey don’t stay crisp on the outside. 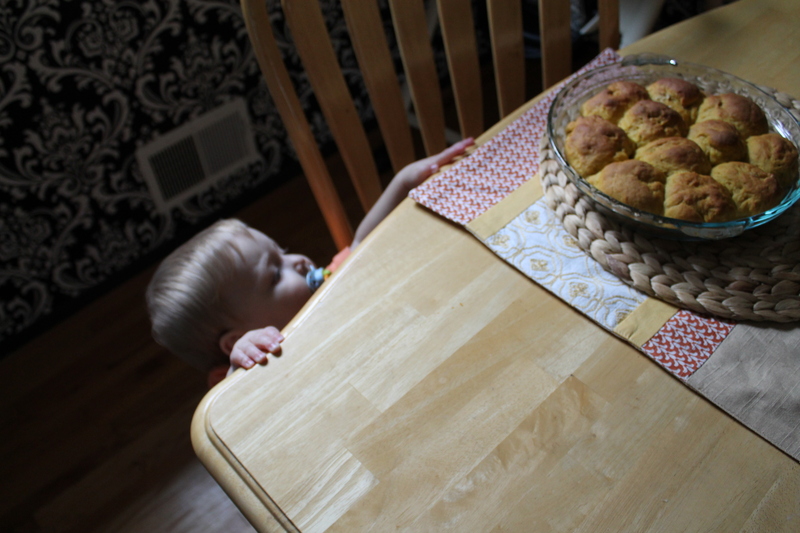 But I think it’s pertinent here because these rolls—as amazing as they are—don’t keep well. After the first day (during which they are clouds of pumpkin delight that I slather with melty butter and inhale like I may never get the chance to eat again), for some reason they dry out in the center. While the leftovers still make excellent croutons and bread pudding (more on that soon! ), I have been seriously contemplating exchanging a few tablespoons of sugar for honey to see whether the rolls will stay moister longer. Just a thought. Maybe you can try it and get back to me? Anyway. Add in the rest of your bread flour, a cup or so at a time, until the dough comes together in a slightly sticky but still touchable clump. 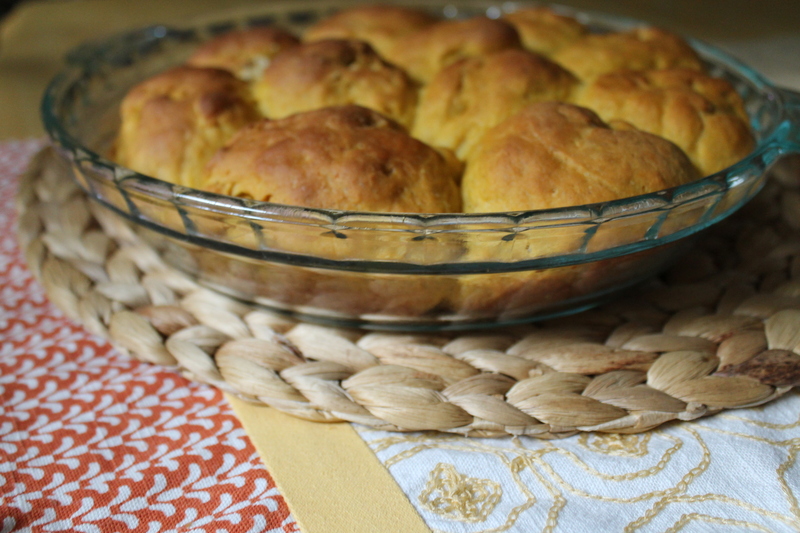 I must admit I actually ran out of bread flour when I was making this batch of rolls (gasp! ), so I transitioned to white wheat. Which I also ran out of. Apparently my flour supply has been hit hard in recent months…so for this particular batch, I ended up with a mix of 5 cups bread flour, 1 cup white wheat, and 1 cup all purpose, at which point I felt my dough was the right consistency. They were still delicious! 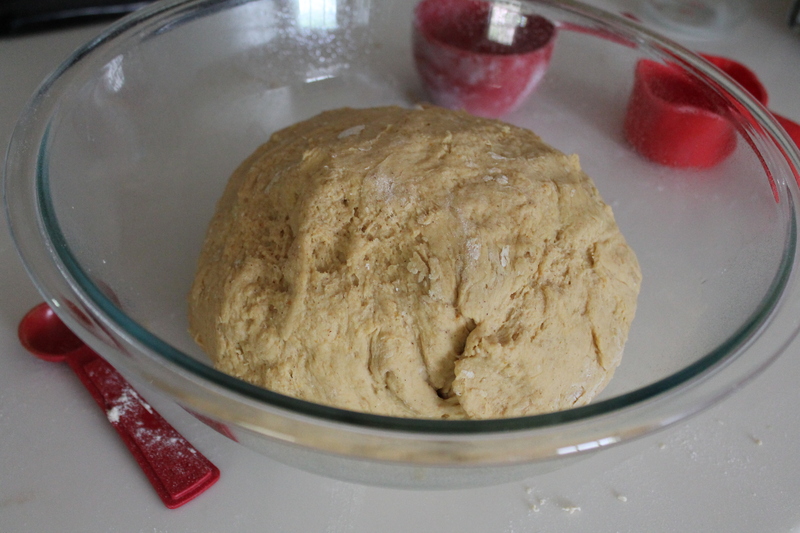 Spread a bit of flour on your counter and knead the dough until it becomes elastic. Shape it into a ball and then let it rise in a large, lightly oiled bowl, covered loosely with a clean kitchen towel, for 1 hour. By now, your dough should have doubled in size. Now comes the hard part: Dividing this massive amount of dough into 30 rolls while a toddler whines and pleads to be picked up. Haha. My strategy was to grab a bunch of glass baking dishes (pie plates work, as do casseroles and brownie pans) and grease them first. Then I divided the dough in half, and divided each half into thirds, distributing among the greased dishes. Yes, that’s six chunks. No, they were not as even as I had hoped. It’s okay; it’s all relative. You just want to give yourself some basic size parameters so you don’t find yourself with 20 super-size rolls or 45 miniature ones. Divide each chunk into five rolls, forming them into balls as you go. It’s okay to borrow or donate dough between the chunks, as long as you end up with roughly even sized rolls. This is important because it will help everything to bake evenly. Place them nearly touching each other in the pans. As it turns out, after all that, I still can’t do math, because I ended up with 39 rolls. Oops. But in my defense, I started out with my smallest “sixth” of dough, so my baseline was a little too small. As I said, it’s all relative, and the main important part is ending up with rolls that are all about equally sized. Cover your pans with a towel and let them rise another 45 minutes. When you come back, they should have expanded and should be touching (or full-on smushing) each other. Bake the rolls for about 30 minutes at 350°. Your bake time will hang heavily on how large your rolls were, so if you ended up with smaller ones, you may want to check them around 25 minutes; if they were bigger, they may need an extra 5–10 minutes. You want the tops to be firm and golden and the centers cooked through completely! 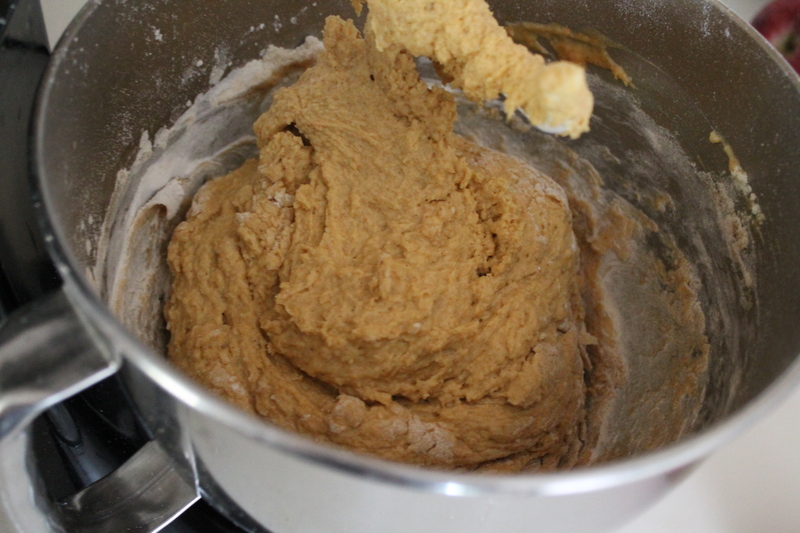 In a stand mixer, combine yeast mixture with sugar, salt, butter, eggs, pumpkin, spices, and 2 cups flour. Beat on medium speed for 2 minutes. Add in remaining flour, 1 cup at a time, until dough is sticky but not too wet. 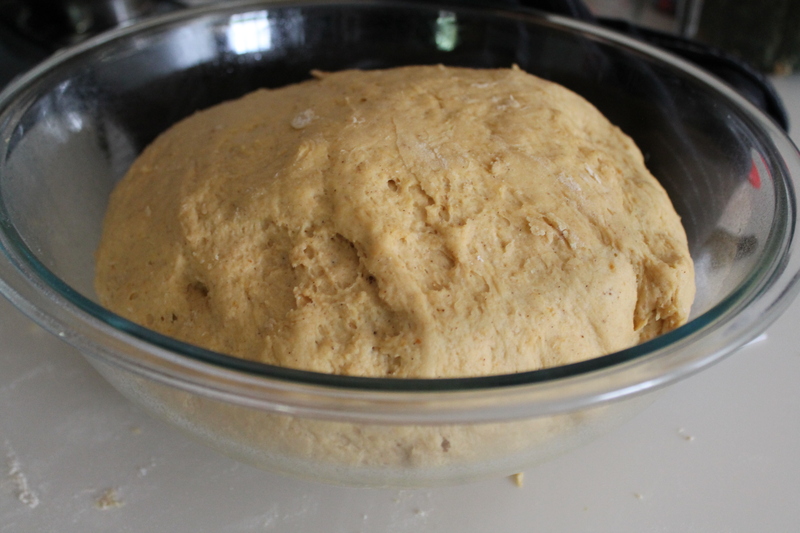 Knead and then place in a lightly oiled bowl. Cover with a cloth and let rise about 45 minutes. 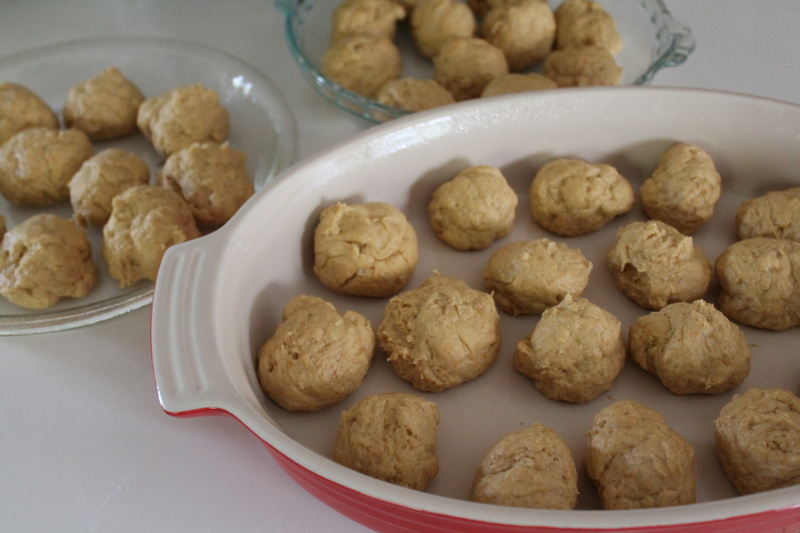 Roll dough into about 30 balls and place almost touching in greased pie plates. (Or for loaves, divide into 3 pieces and place in greased loaf pans.) Cover loosely and let rise until double, about 45 minutes to 1 hour. I realize my question seems rather simple. I never like any of the bread recipes I make, store bought always is better. And I only buy bread when it’s specifically for a meal. I would love to try this recipe but not sure what to pair it with. Is it more of a dinner roll? Dessert? Breakfast? Luice, these rolls are my go-to for nice occasions. I bring them to Thanksgiving dinner and Christmas dinner. They are lightly sweet, but not overwhelming for a main course. They complement poultry well (I’m told). 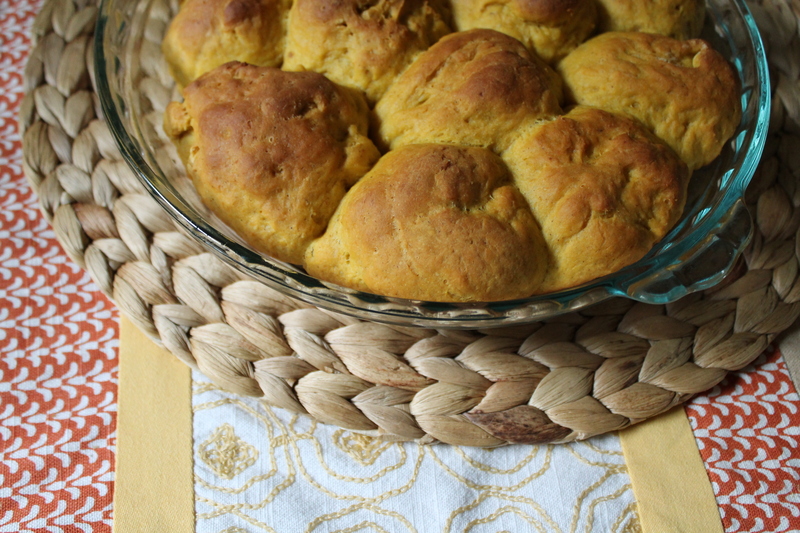 They go great alongside salads (ooh, maybe one with butternut squash in it!?) and I like them with more bitter flavors, too, like brussels sprouts. You could probably even make sliders with them, maybe with some caramelized onions and Gruyere cheese! Honestly, I think they go well with almost everything.